Permanent gardens constructed above ground are often referred to as raised beds or square foot gardening. These types of gardens are popular for a number of reasons. Raised beds allow for more closely spaced planting, thus more production from a smaller space. Closely spaced plants also crowd out and reduce the number of weeds. Soil in above ground beds tends to warm up faster in the spring, allowing for earlier planting and quicker yield. Raised bed gardens can be filled with a more superior quality soil than the native soil below it. The higher quality soil allows for better drainage and increased yields. Raised beds are smaller and easier to maintain. Raised bed gardens tend to dry out quickly during hot summers. Locate your garden in an area that is easily accessible to a water source. Choose a spot that receives at least 6 hours of sun with all day sunlight being most desirable. Raised beds are usually bordered by some type of framing. Materials used might be logs, wood planking, rock or manufactured blocks or bricks. Gardens can be any length but the width should be no more than 4 ft. The average person can reach the center of the garden from either side of a 4 ft. wide bed. This way, the soil does not become compacted due to walking on the garden area. Popular sizes seem to be either 4ft. x 4ft. or 4ft. x 8ft. The garden bed should be approximately 9-12 in. deep. This is the depth at which most of the main feeder roots of vegetables will be located thus allowing for optimal nutrient and water uptake. There is no shortage of “recipes” for the best type of soil to use in raised bed gardens. Most tend to agree that a mixture of 1/3 compost, 1/3 peat moss and 1/3 vermiculite works best. 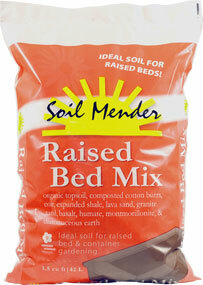 Soil Mender Raised Bed Mix is an all organic mix containing topsoil, composted cotton burrs, coir, expanded shale, lava sand, granite sand, basalt, humate, montmorillonite and diatomaceous earth. It is a quick and easy way to get your raised bed up and going – no tilling or mixing, just open the bag and pour! Some experts recommend that the soil below the bed be loosened to a depth of 6-8 in. and a small amount of the new garden bed soil be worked into this existing soil. This will improve drainage and avoid any problems that can arise from having two different soil layers. Once this is complete, you are ready to fill in the frame with the good stuff! Raised beds are perfect for growing all types of vegetables and herbs as well as some new varieties of dwarf blueberries and raspberries. Space is at a premium, so planning the layout is important. Succession planting is the method of locating crops based upon maturity time. For instance, leafy vegetables such as lettuce and spinach are short-season crops and once harvested that spot can be replanted with warm-season crops such as beans and cucumbers. Interplanting is a way to utilize empty row space. Try planting onions, radishes or carrots between rows of tomatoes or peppers. These crops will be harvested early allowing the tomatoes and pepper to take up the rest of the space. Using trellises for growing vining crops such as pole beans and cucumbers is an excellent way to increase the capacity of the raised bed. A fall garden is another way to extend the yield of your garden bed. Good producers for the fall garden include broccoli, cauliflower, cabbage, and leafy greens. Spacing for the plants depends upon the size of the crop. Small crops such as greens and root crops will be more closely spaced while medium crops such as snap beans, peas, peppers or eggplant require about 1 ft. of space. Larger crops such as tomatoes need to be on 12-18 in. centers. Tomatoes should be staked or caged. Generally, your garden requires one or more inches of water per week. 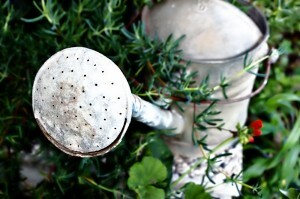 Drip irrigation or the use of a soaker hose allows the water to slowly soak into the root zone with less evaporation. Raised beds are fertilized in much the same manner as traditional gardens. An application of fertilizer is generally made at planting and additional applications are made during the growing season depending upon the crop. Espoma brand organic fertilizers are long lasting, slow release formulations containing beneficial microbes. Espoma Garden-tone is applied at planting at the rate of approximately 1 lb. per 4ft. x 4ft. garden area and worked into the soil at a depth of 4-5 in. Repeat the application every 3-4 weeks throughout the season. For tomatoes, 3 tablespoons of Espoma Tomato-tone is added at transplant and reapplied every 2 weeks. Mulching your garden is highly recommended. A layer of mulch, 2-4 in. deep, will help conserve moisture, cool the soil and suppress weeds. Mulch made of wood chips, cotton burrs, coco bean shells or even straw can be used. 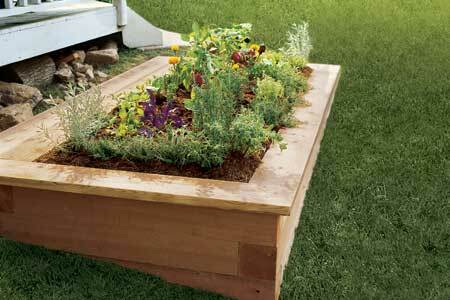 Planting a raised bed garden is a fun weekend project that can involve the whole family. And, before you know it, you’ll all be enjoying delicious, nutritious vegetables fresh-picked from your own garden!